Equinox, Eureka and Vic Secret used in MaMoo. MaMoo, an American India Pale Ale, pulls inspiration from my mother. My mom has always been a heavy set person. She likes to eat. I have inherited that trait. Since my mom was the only female in the family, she took the brunt of our chiding (there was enough for everyone). We had many nicknames for each other throughout the years. Of course nicknames should typically be based on the person that is receiving the nickname. Due to my mom’s size and shape, the nicknames typically could have been deemed as condescending. But Moo Cow eventually progressed into MaMoo. It rolls of the tongue better. My mom was the backbone of the family. She was a throw back mom. She did all the laundry, made dinner, cleaned house, made lunches to bring to school, cleaned up after the dog, gardened and more, all while working full time. She was selfless, always looking out for everyone else, making sure they were happy. As I have become a parent, I really appreciate the sacrifices she has made. Even more I appreciate the time she likes spending with my kids, playing board games The kids really look forward to visiting with granny to play. She is one in a million. They don’t make them like my mom anymore. I am thankful that my mom was always there to lend advice (even though I didn’t feel that way at the time). Enjoy! 2017-03-12 (morning): @62.4*F, slow fermentation, placed on heat blanket set at 68.0*F.
2017-03-12 (evening): @90.3*F, fantastic fermentation. Thermometer fell off. Removed from heat. 2017-03-18: Bottled with 3.5 ounces of priming sugar and 2.0 cups of water. 26, 22 ounce bottles. Bottle crown label: Ma. Useless Fact: 8 billion chickens are consumed in the U.S. each year. 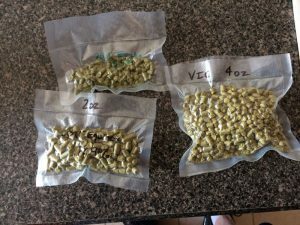 This entry was posted on Saturday, March 11th, 2017 at 9:46 am	and is filed under Beer Recipes, Home Brewing. You can follow any responses to this entry through the RSS 2.0 feed. Both comments and pings are currently closed.